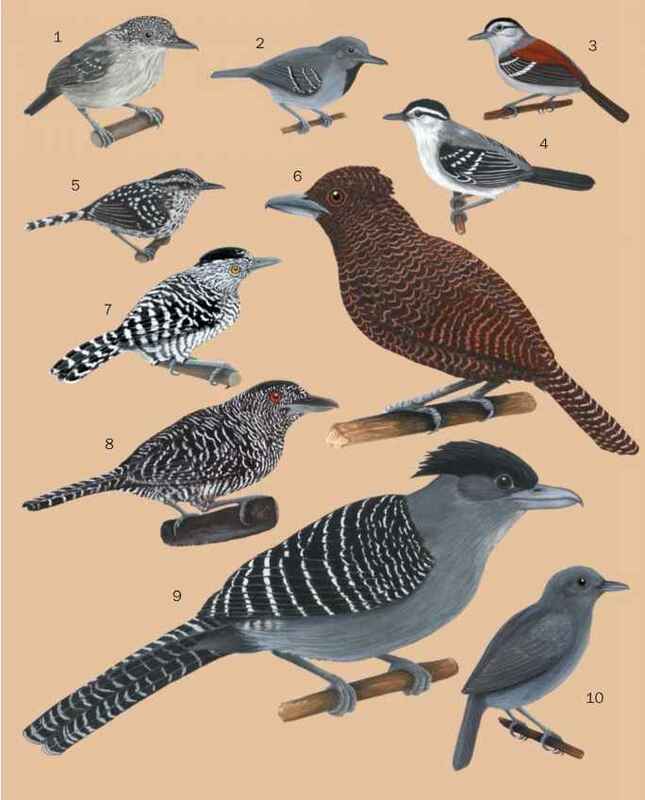 Plantcutters (in South America, also called cortarramas, cortaplantas, and raras) look at first glance like rather ordinary, finchlike birds with a few exotic splashes of red applied to mostly gray or brown plumage. Head plumage rises to a short crest in the Peruvian and red-breasted plantcutters. Individuals are about 7 in (18-20 cm) long and weigh about 1.5 oz (40 g). They are short-crested and have short, stout, conical bills. The wings are short and pointed, the tail long, and the legs short with large, strong feet. The sexes show considerable dichromatism. Males are more brightly colored, especially with reds, while females are more grayish to brownish. A close look at the plantcutter bill reveals a feature rarely seen among birds: rows of tiny, strong, sharp, toothlike projections run the lengths of the tomae, or bill edges, on both sides of each mandible. These are not bony teeth but, rather, outgrowths of the keratin substance of the bill. The birds use these bills to saw through and to chew leafy vegetation, their main food source. Peering at a close-up photograph of the head, with the rows of sharp, forward-leaning pseudo-teeth, accentuated by the glaring red or golden eye, is more like coming face to face with a dragon than with a small, herbivorous bird.